Bet Mar Liquid Hobby Shop: Sodium Hydroxide (.2N) for acid test kit, 5 oz. 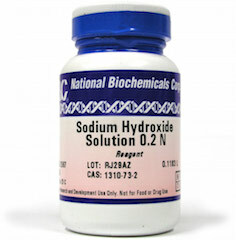 Sodium Hydroxide (.2N) for acid test kit, 5 oz. Sodium Hydroxide for acid test kit, 4 oz. This is the replacement Sodium Hydroxide for the acid testing kit. It is used as the reagent when testing your acid level of the wine. Currently the concentration level is 1/5 normal.